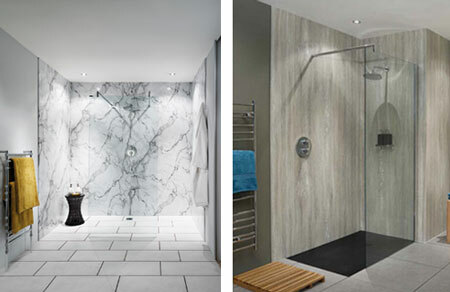 Shower and wall panels in the bathroom make a great looking easy solution for durable bathroom decoration. With matching worktops you can coordinate shower enclosures and bath splashbacks with vanity surfaces and window cills for an integrated look, or create a floor-to-ceiling water resistant wetroom. We supply the Bushboard Nuance range of Shower and Wall Panels with matching worktops, and the Aquamura range of Shower and Wall Panels. Both have a wide choice of decors to suit all tastes. The Bushboard Nuance bathroom range features the latest decor and texture combinations to provide a tactile finish that is perfect for creative bathroom design. Some decors are subtle with neutral tones whilst others such as Antique Paladina make a spectacular contemporary design statement. Nuance wall panels feature a unique and completely waterproof core material combined with a wrap around edge. This allows an uninterrupted installation of the panels without unsightly trims. 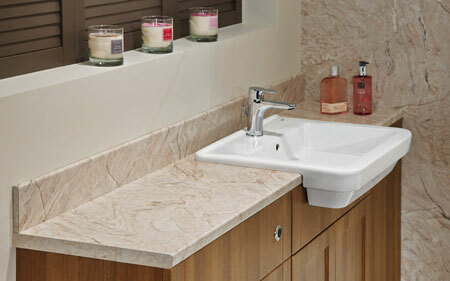 The use of laminate worktops and matching wall panels in place of tiles not only gives you a much quicker installation, but provides you with an easy clean surface with no grout to attract mould. 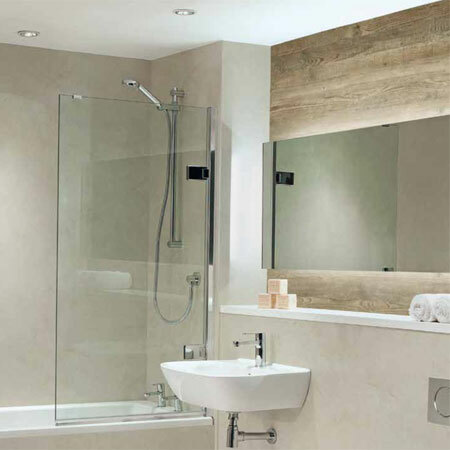 We also stock the ever popular Aquamura range of laminated plywood shower and wall panels. This range is often used on commercial refurbishment projects due to its competitive price point, but is equally suitable in any domestic installation. There is a substantial choice consisting of 10 basic decors, 12 premium decors and a selection of metallic finishes.